As a minimum, welfare conditionality within the social security system needs to be rebalanced. The current preoccupation with sanctions backed compliance needs to be urgently reconsidered with more emphasis and resources focused on the provision of personalised employment support. 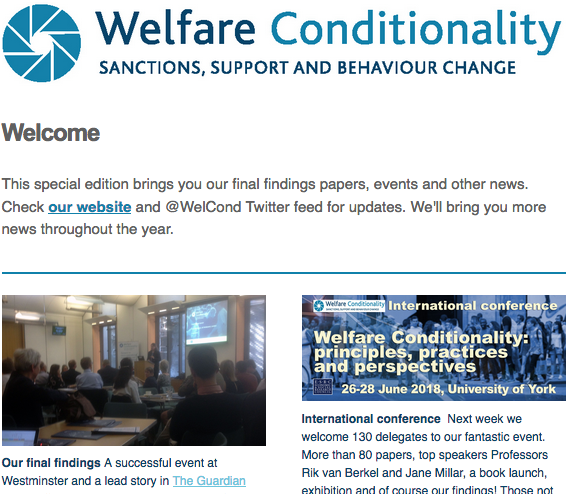 The wider application of welfare conditionality within the benefit system for disabled people, those dealing with additional issues such as homelessness and alcohol or drug dependency, and for in work UC recipients, should be paused forthwith pending a more fundamental enquiry into its ethicality and usefulness for these groups. More generally, in light of the growing body of evidence on the ineffectiveness of the intensified and extended system of welfare conditionality in moving people off social security benefits and into work, it is time for a comprehensive review of its continued use. Our project submitted written and in-person evidence to Professor Alston for his official visit to the UK in November 2018. In our evidence, Project Director Professor Peter Dwyer, University of York; Dr Lisa Scullion, University of Salford, and Dr Sharon Wright, University of Glasgow, wrote on behalf of our project on the erosion of economic and social rights as a core component of national citizenship status and justifications for such rights on the basis of universal human needs. Based on our final findings, the researchers’ evidence details how benefit sanctions leave many unable to meet their basic needs, with those sanctioned increasingly reliant on charitable and (where available) familial provision for support.